People can expect to find a total of 111 residences at the luxurious Bayview Village condominium which come in two-bedroom up to six-bedroom options and in a variety of four different floor plans. 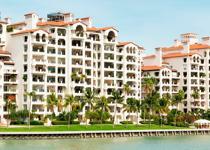 Residences range from 1,950 sq. ft. to 9,590 sq. ft. in size. Being among the most spacious options on Fisher Island, Bayview Village is definitely the perfect option for people who seek indulgent comfort in one of the island's most amazing communities.